I recently bought myself an Asus Eee 701 4G Surf from Expansys for the bargain price of 169.33 including delivery. If you don’t know about these tiny laptops, they’re low-spec, cheap machines often times running a Debian-based Linux installation called Xandros, rather than Windows (although XP versions are also available in the higher spec versions). Its key specs are a 7-inch screen, 512MB of RAM (upgradeable to 2GB), built-in WiFi and hard wired ethernet ports, 4GB solid-state drive, weighing only 922g, and really really small. 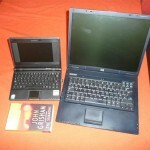 For those of you that just about nodded off to sleep – it’s really light, really small (for a feature-packed laptop, I mean), and lets you use word processing, spreadsheets, browse the Internet, read emails, blogging, instant messenger, Skype and, well – just about everything you’d normally do on your laptop really. Except… did I mention it’s really portable? I’m not totally sure where it fits into my technology arsenal yet. It’s certainly not a desktop replacement, and it might even be best described as a second-laptop (the first of which, I hasten to add, spends way more time charging than it ever does getting used). 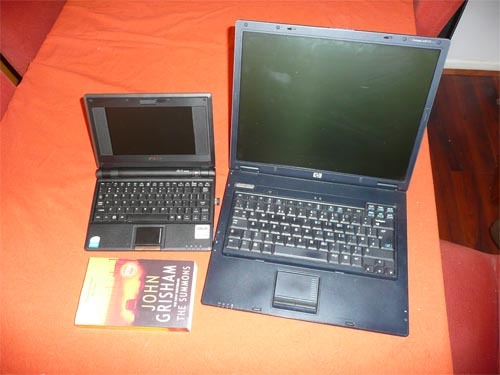 But the Eee PC is certainly a lot easier to carry around, and more likely to be dropped into my rucksuck as an afterthought since it takes up so little space. It’s also been described as “something to play with” and the Eee fits into this category just as well as it would as a solid dependable netbook (if you’d rather leave the endless tinkering alone). Perhaps it’s because the device is so cheap, or easy to reinstall the base system with all your essential apps in tact (take that Microsoft) – but even if you’re just looking for an alternative to Windows, the Eee might just be a good place to start.